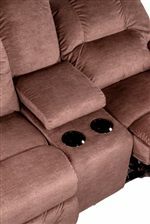 The EASTON La-Z-Time® Full Reclining Loveseat w/Console by La-Z-Boy at Conlin's Furniture in the Montana, North Dakota, South Dakota, Minnesota, and Wyoming area. Product availability may vary. Contact us for the most current availability on this product.